Walking out of an artist’s shop with a brand new tattoo is one of the best feelings in the world. You’ve spent your hard-earned money on something that will last your whole life and something that speaks to the uniqueness of you. 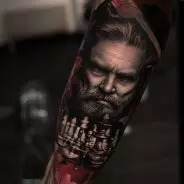 However, a good artist will have informed you of a strict aftercare regimen you must follow to keep your tattoo in tip-top shape. After all, a fresh tattoo is essentially an open wound, prone to infection and scarring. This could the look of your new ink and turn it into a permanent eyesore. This oil is an antimicrobial and antiseptic oil, which means it fights off harmful bacteria that looks to make its home in open wounds like tattoos. Helichrysum also has anti-inflammatory properties, which will help with any swelling and itching that sometimes happens after a fresh inking. Frankincense also protects wounds from infection and helps them heal faster. Speeding up the healing process not only reduces the chance for nasty infections, but decreases the amount of time spent in itchy discomfort. That also means showing off the new ink sooner. Even if you’ve never heard of this oil, you can find it easily on a site like PurePath Essential Oils. Frankincense and Myrrh? It’s biblical alright, especially when they are combined to heal a tattoo. Myrrh oil is also an anti-septic, which will fight harmful bacteria. It also can be used to stop bleeding, which can sometimes happen right after a new tattoo is applied. It supports the skin’s natural ability to heal and care for itself, as mentioned here in Organic Health’s article. Lavender oil is a natural pain reliever and soothing oil. Sometimes a fresh tattoo can be inflamed and painful. Lavender oil will not only ease the physical pain, but the calming properties will also help with any anxiety and discomfort, as you can see in a natural perspective article. Lavender also has a decent SPF, which will help protect new tattoos from sun damage. But try your best to stay out of the sun anyway, because the sun can leech the color right out of a fresh tattoo, and that’s money wasted. Essential oils are a great natural way to care for a new tattoo and sustain good overall health. While some people may have allergies to certain oils, there is usually an alternative that can easily be substituted, while still keeping the healing process all-natural. You can shop for health products like these oils very easily online in preparation, before you even go to your tattoo appointment. Always remember, comfort and care are the keys to long-lasting and beautiful tattoos. Happy inking!